With one week to go in the pool stage we already know that Queensland and New South Wales have qualified for the play-offs in the Super W. Will Brumbies or RugbyWA join them? The last two weekends down under have seen two win for NSW Waratahs, a narrow first win for Western Australia, and a Queensland win in what was effectively a semi-final rehearsal against the Brumbies. Two weeks ago the weekend opened with the two basement sides meeting in Melbourne, with the much battered hosts taking on RugbyWA, also winless. Melbourne began badly, conceding five first half tries, going in 28-0 down, but showed character to find their feet and match their opponents in the second period – the final score being 38-10 to RugbyWA. But the game of the weekend – indeed the game of the entire pool phase – was inevitably NSW against Queensland. Queensland struck first in the sixth minute, converting some early pressure with a try from wing Alana Elisaia. NSW hit back with a spectacular first try in the 15th minute, finished of by Maya Stewart. Fullback Hewson managed to stay just out of touch on the right sideline and the Waratahs went touchline to touchline to put Stewart through a gap and the winger powered over. NSW left winger Shanice Parker added a second soon after Queensland fullback Lori Cramer had a deep NSW kick bounce into her face before rebounding into open space for Parker to run onto. With a penalty from Ashley Hewson NSW lead 15-7 at the break. The second half was tighter than the first with neither side able gain an advantage until the 68th minute when Queensland’s Wong’s try narrowed the gap to three points. The Waratahs defence was under constant pressure for most of the rest of the game but the visitors ultimately ran out of time. Last weekend NSW all-but guaranteed a home final with a 31-0 win in Perth against RugbyWA. On a very hot day, NSW were too strong for their opponents, winning by five tries to nil. The other game amounted to a rehearsal for the likely semi-final to decide who will meet NSW in that final – and Queensland just came out ahead thanks to tries either side of the break from centre Cecelia Smith. 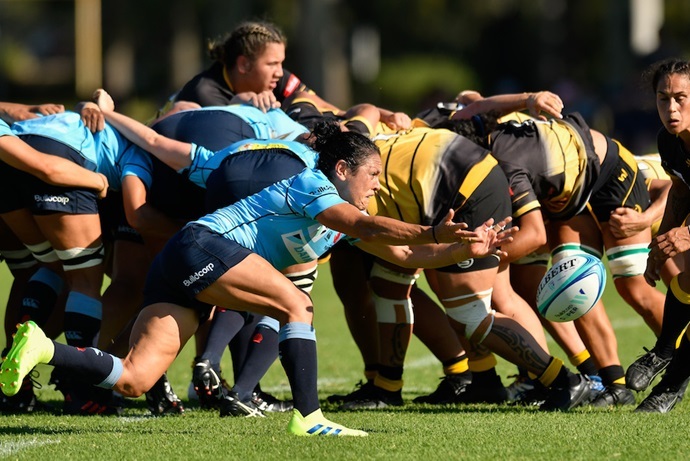 A steamy day after an overnight storm made conditions difficult, and Brumbies successfully frustrated their more fancied opponents – tactics that Coach Moana Virtue said they plan to repeat in the playoff in two week’s time. The final weekend of the regular season sees NSW hosting basement team Melbourne, with a win guaranteeing them that final place. Given Melbourne’s results this year and last this seems by far the most likely outcome. The Brumbies will be favourites when they travel to Perth for a straight knockout game to see who will play Queensland in the semi-final on 30th March.